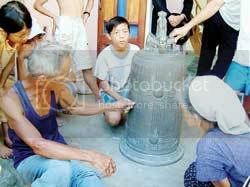 10 July 2007 (Vietnam Net Bridge) – A 14-year-old unearths a bronze bell in Quang Nam province in Vietnam. Unfortunately, no other information about the bell was provided, although the Han dynasty lettering on the bell implies a date between 200 BC and 200 AD. A 14-year-old kid named Duong Quoc Hop from Thang Binh district in the central province of Quang Nam has recently found an ancient bronze bell while looking for metal waste right inside his homeâ€™s garden. The bell was buried at 1.5 m underground in quite original conditions. Its diameter is 0.45 m; height 0.94 m, and weight 100kg. The body of the bell has many sharply-engraved Han letters. Yesterday afternoon, July 9, a team from Quang Nam Museum and the Department of Culture and Information visited the kidâ€™s house and tried to persuade his family to hand over the bell to them for investigation. 15 June 2006 (Vietnam News Agency) – Short post on a Han dynasty brick tomb found in the Uong Bi District. Experts from the northern province of Quang Ninh’s Archaeology Institute and the Culture and Information Department have discovered an ancient tomb in Yen Tu relic, Uong Bi district.